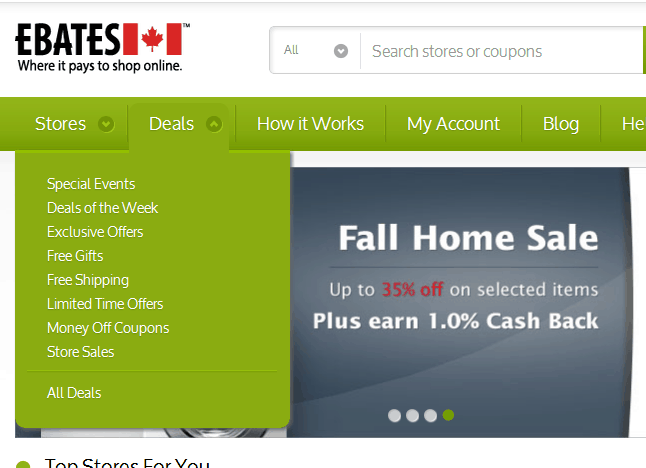 Ebates introduces online cash back shopping with Ebates Canada. I like shopping from the comfort of my home! Kids go to bed and I browse the web for the things I am looking for. I can compare prices and read the reviews about the products, with no hassle to park the car or hurry to be back on time for kids homework or practice. It is very convenient! Unfortunately as a Canadian, I don’t have as many offers, choice of stores as my neighbors in the US. I don’t have those opportunities of earning cash back on my purchase. Besides when I shop oversees, I can be struck by those duty fees! But the store doesn’t mention if I will be charged duty fees or not. It is frustrating to pay $20 duty fee for a $50 product!! But now my frustration is over. I can shop online, get access to fantastic coupons, lots of stores and earn cash back on my purchase! I can choose to buy from Canadian companies, US ones and will be informed if there is duty fee or not. How? With Ebates Canada. 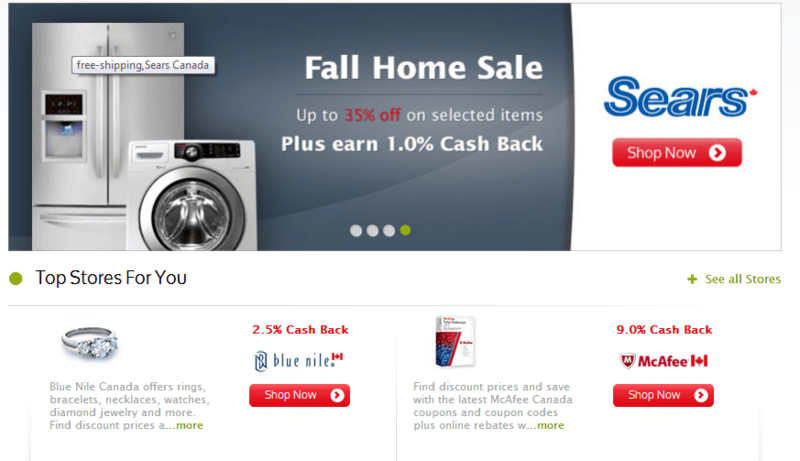 Ebates Canada: Earn cash back on your online purchase. Get started as soon as you sign up! As a Canadian, you will have access to 500 stores in Canada or providing shipping to Canada. You will be informed if there is any duty fee. Plus, you will get a cash back on your purchase! You will be paid each quarter via Cheque or PayPal. How convenient is that? Joining is free and takes 15 seconds. You will get a bonus gift card. I chose the ICE one. You can sign up with Facebook, although I chose to sign up with my email account. As soon as you sign up, you receive a welcome email and you are ready to start. Your preferences: if you want to shop in Canada only or US. The site is nicely designed and easy to browse. At first you will have a slider with the featured opportunities. Then the top stores with the cash back percentage. Below the top stores, you will find the best deals/coupons of the day. Even on the best deals and coupons, you can earn cashback which is a win win situation. I loved this 30% deal on Gap backpack where your can also earn 2% cash back. You can shop by store category.They have 14 categories from babies, clothes, grocery, computer, travel, financial services. You can also shop by deal. Each time you refer a friend and he/she makes a $25 purchase, you earn $5. You can even earn $30 when you refer 3 friends! 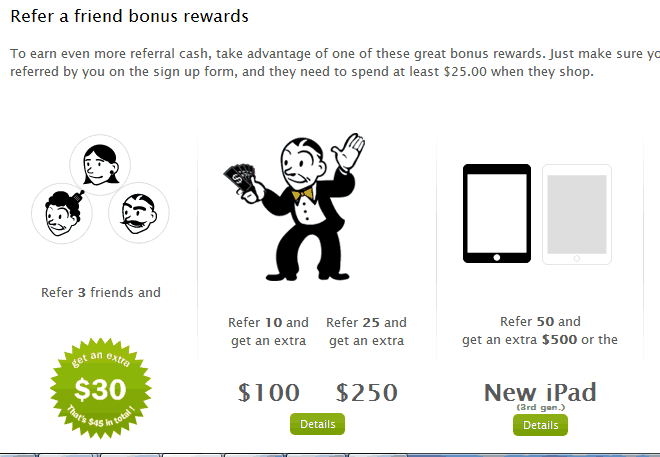 You can even win an Ipad if you refer 50 friends. Sign up TODAY! Founded in 1998, the Ebates brand supports more than 12 million savvy shoppers around the world and has paid over $100,000,000 in cash to its members. 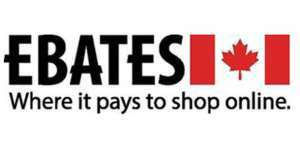 Ebates Canada, headquartered in Toronto, ON, Canada, is a division of Performance Marketing Brands (PMB), owner of the world’s most rewarding shopping programs. I really enjoyed browsing the site! I will be purchasing few things in the coming weeks! I will share with you my experience! Stay tuned! In the mean, sign up and share it with your friends! Sign up TODAY! Disclaimer: I was provided with a thank you item for my participation. All opinions are mine. I love shopping online and using Ebates. It’s such a bonus to know you will get cash back when you need to buy items! Love Ebates! Very cool that Canadians can get in on the action. 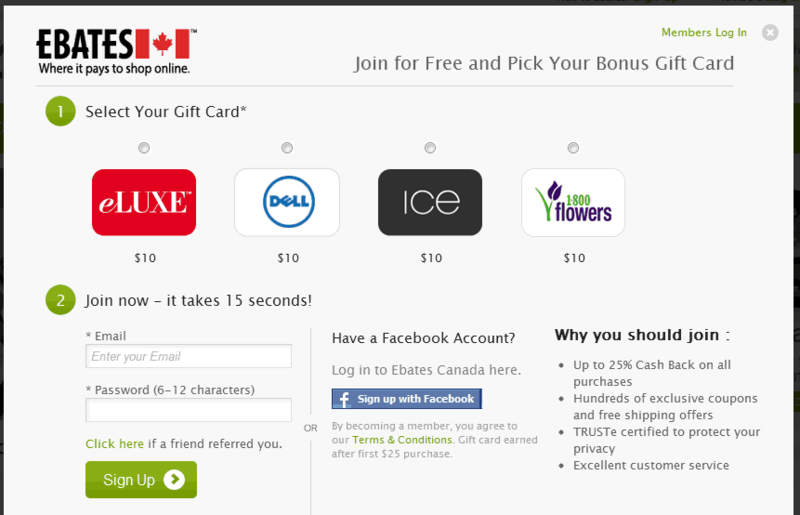 I am obsessed with Ebates so glad to hear they finally made it available for Canada, too! Online shopping is getting better and better, I love it, especially when buying a gift for someone. This sounds awesome, I’ll have to check this out later today, thanks for sharing! I love online shopping…. may as well get incentives for it. Thanks for sharing! This sounds great! Online shopping is so popular and convenient now, and I love the incentives with this 🙂 I’ll have to check it out! New Year Resolutions Roundup: Get Fit, Organized and Financially Secure!